The extent of fusion for degenerative lumbar scoliosis has not yet been determined. 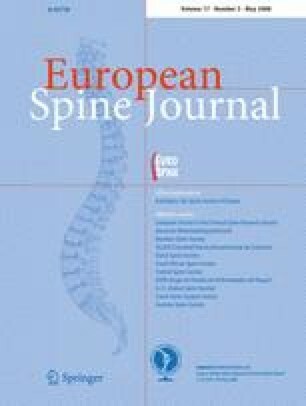 The purpose of this study was to compare the results of short fusion versus long fusion for degenerative lumbar scoliosis. Fifty patients (mean age 65.5 ± 5.1 years) undergoing decompression and fusion with pedicle screw instrumentation were evaluated. Short fusion was defined as fusion within the deformity, not exceeding the end vertebra. Long fusion was defined as fusion extended above the upper end vertebra. The lower end vertebra was included in the fusion in all the patients. The short fusion group included 28 patients and the long fusion group included 22 patients. Patients’ age and number of medical co-morbidities were similar in both the groups. The number of levels fused was 3.1 ± 0.9 segments in the short fusion group and 6.5 ± 1.5 in the long fusion group. Before surgery, the average Cobb angle was 16.3° (range 11–28°) in the short fusion group and 21.7° (range 12–33°) in the long fusion group. The correction of the Cobb angle averaged 39% in the short fusion group and 72% in the long fusion group with a statistical difference (P = 0.001). Coronal imbalance improved significantly in the long fusion group more than in the short fusion group (P = 0.03). The correction of lateral listhesis was better in the long fusion group (P = 0.02). However, there was no difference in the correction of lumbar lordosis and sagittal imbalance between the two groups. Ten of the 50 patients had additional posterolateral lumbar interbody fusion at L4-5 or L5-S1. The interbody fusion had a positive influence in improving lumbar lordosis, but was ineffective at restoring sagittal imbalance. Early perioperative complications were likely to develop in the long fusion group. Late complications included adjacent segment disease, loosening of screws, and pseudarthrosis. Adjacent segment disease developed in ten patients in the short fusion group, and in five patients in the long fusion group. In the short fusion group, adjacent segment disease occurred proximally in all of the ten patients. Loosening of distal screws developed in three patients, and pseudarthrosis at L5-S1 in one patient in the long fusion group. Reoperation was performed in four patients in the long fusion group and three patients in the short fusion group. In conclusion, short fusion is sufficient for patients with small Cobb angle and good spinal balance. For patients with severe Cobb angle and rotatory subluxation, long fusion should be carried out to minimize adjacent segment disease. For patients who have severe sagittal imbalance, spinal osteotomy is an alternative technique to be considered. As long fusion is likely to increase early perioperative complications, great care should be taken for high-risk patients to avoid complications.